These candidates have to get it right. If a candidate wants to win, he or she must show the best of who they are, what they want (for their constituents, hopefully) and why they want it. Are you familiar with your audience and what’s important to them? Candidates have a team of people whose sole purpose is to prepare them for their respective big nights. Defining a clear goal and objective for the event, the staffers start their research and make lists of all the possible topics. They explore the audience composition and sift through demographics. These staff members create possible questions the moderators or audience may ask and are even prepared to help the candidates practice the conversations themselves. To have any kind of success in a debate, the candidate must be prepared – and you know when they haven’t. How do you want to show up to your networking event? Do you want it to be time well spent because you know what you were there to accomplish? Don’t you want people to walk away from a conversation thinking you knew your stuff? Be prepared – people will notice. Are you ready to listen to the questions and responses so you can participate intelligently? A candidate can win or lose a debate with not only the response to the initial question but also the rebuttal to the opponent’s response. 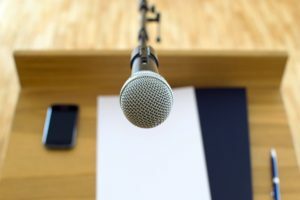 The better the candidate’s ability to listen, the better his or her chances are of casting just the right comment to make the desired impact on the listeners. You have this same super power. By allowing yourself to be in the room, removed from distraction, and ready to listen, you open yourself up to some really engaging conversation. Are you bringing your best self to the audience? Make no mistake. When our candidates step out on stage, they are wearing outfits that have been painstakingly picked to project the right character of the person wearing them. Have you noticed that men coordinate ties? I’d love to be a fly on the wall to hear staffers argue about who gets to wear the red tie and who gets to wear the blue. People notice what we wear, so shouldn’t it reflect the best of our personalities and our authentic style (ahem, pantsuit, ahem)? But we can’t forget that our authenticity isn’t just represented by our fashion sense. People are going to pay attention to what we say. Let what you say about yourself match the person you want others see when you walk in the room. While being authentic may introduce the risk that you may not click with some, when you are authentic you will always find fans. Are you thinking about your follow up? “I’m not going to talk about the debate last night,” said no candidate. Ever. Any candidate with a hope of being elected has a progression plan post-debate whether it’s a stump speech (or several), media interviews or tweets. Candidates don’t want what they’ve said to be forgotten. They have a plan to follow up and burn their message into the minds of their supporters and prospective supporters. What about you? How are you following up after your event? Do you have a stack of cards in your desk drawer? Pick five and make a coffee appointment or send a thank-you email for the time that person spent in conversation with you. You never know whose vote you’ll end up getting or even where that connection will lead. Don’t sit on your cards; use them! Want to know more about these networking tips and how you can use them on and off the campaign trail? I’m sharing all the tips at once in a 45 minute webinar. Join me on October 18 with your questions and let’s talk about the tips and tricks you can use to “Own the Room” at your next networking event.